Turn on Preview to see the changes being made before any effect is applied, and move the Tracing Options box off of the image. The default setting is black and white, which is great if the final product is, say, a two- or three-color screenprint. There are many options available in the Presets for you to play around with. You will rarely, if ever, use the Hand Drawn Sketch, Technical Drawing, Inked Drawing, or Lettering presets, but it’s fun to test them all, especially when you’re first getting familiarized with Live Trace. The Threshold value tells Illustrator where we want to trace our lines and is only available for the black and white mode. A high threshold setting creates a “heavier” image as more gray pixels are represented as black; conversely, a low threshold represents more gray pixels as white and results in a “lighter” image. 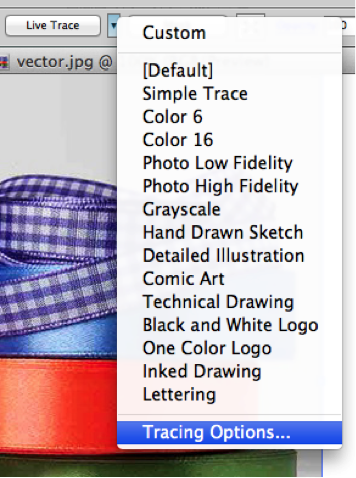 All of the presets can be changed to Color, Grayscale, or Black and White by selecting the appropriate Mode. 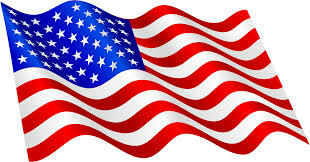 The number of colors can be increased or decreased by adjusting the “Max Colors” setting. Blur is set to 0 pixels by default, and anything higher will add more Gaussian blur. A lower Minimum Area or higher Path Fitting will sharpen your lines (though too low a Path Fitting results in jagged lines), and a lower Corner Angle will sharpen your corners. 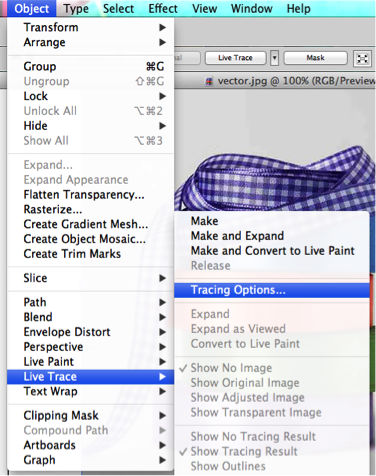 By clicking the Fills checkbox, Live Trace creates closed, filled vector paths, and the end product more closely resembles the original image. 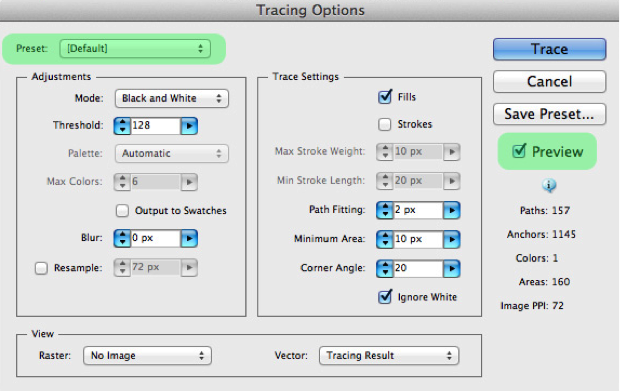 When the Strokes checkbox is selected, Live Trace creates stroked, open paths when the original stroke weight is less than or equal to the Max Stroke Weight setting, and so fewer anchor points are left in the final image. Clicking the “Ignore White” checkbox makes it so that any pure-white spaces inside and surrounding the image aren’t identified as additional shapes. If you want this, Ignore White has to be the last step before you apply the Live Trace settings. Once you’re happy with the image, click “Trace” on the dialog box and then “Expand” from the top bar. Voila! You now have a vector image.